The second installment of Fire Mountain Games‘ evil adventure path centred on serving Asmodeus is 106 pages long, 1 page front cover, 1 page editorial, 1 page ToC, 1 page SRD and 1 page back cover, leaving 101 pages of content, so what exactly do we get? Still here? That means you’re either foolhardy or classified to know about the information, so let’s take a look! After Adrastus Thorn’s ninth knot (i.e. your PCs) have unleashed terror, death and destruction by opening Talingarde to the hordes of the fire-axe, they have been enjoying a pleasure-cruise with Tiadora, the handmaiden devil, who leaves a trail of demoralized villages in her wake, pillaging and raging at the populace in the guise of Mitran clergy and knights in a bid to destroy the unity of the nation. But that’s only the intro. 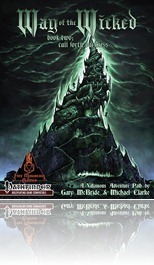 Once the PCs have reached Farholde, they are tasked to do what another knot has failed to do – locate the famed Horn of Abaddon, summon the daemon prince Vetra-Kali Eats-the-Eyes and claim the famed tears of Achlys from the bringer of pestilence – a supernatural plague upon the land to serve as a second strike to break the nation of Talingarde. The seventh knot under the command of Elise Zadaria, which the PCs know from their indoctrination/training and which might contain potential love interests, is to stage murders and keep the town in line and the PCs up to what’s going on. But before the Ps can get to anything, they have to meet with the local Asmodean elven noble, NOT blow his cover and enlist his aid. With some basic research, the PCs can unearth the location of the dread Horn of Abaddon among the jungle-covered spires of the Caer Bryr. Unfortunately, the fourth knot has not failed solely due to incompetence – the horn is guarded by quite a powerful treant and far from abandoned. The lower caves of the place are now inhabited by a tribe of Dagon-worshipping boggards. Once the PCs manage to slay the treant and enter the boggard-territory, the adventure starts to feel different immediately: They may actually slay the leader, enlist the drug-addled, mad shaman and subjugate the whole tribe. Until now, if you take away the lillend with her elven/feyish consort who attack and harass the PCs, the overall fortress is a standard dungeon exploration – only…it is not. You see, the Horn of Abaddon was once home to a dread, pestilence-worshipping daemon cult and was squashed by the legendary paladin-king dubbed “the Victor”, its evil sealed. Thus, the PCs encounter remains of the horn’s original defenses, natural predators that have invaded the place, undead remnants of the cult and daemons still standing guard. Inc ontrast to a traditional dungeon, though, the horn’s defenses lie in tatters: There’s even a good shrine to Mitra impeding evil magic here! And the paladin-king screwed the PCs over in the worst way possible – he created a seal to prevent Vetra-Kali’s return and the damn thing is an artefact! Even with the 3 eyes of Vetra-Kali, logically and cleverly hidden in the complex, the PCs have no idea on how to break the seal – unless they explore or listen to the mad ramblings of the boggard shaman. For your ease, Fire Mountain Games provides a 4-page handouts pdf available for free, which contains key-less maps of the dungeon and surroundings as well as a one-page spread of the defunct golem. Defunct Golem? Yep, among others, the PCs may activate a sociopathic alchemical golem who may make for a dread sentry, but only if posted alone – living creatures tend to die ugly around it and only if the PCs manage to find all ingredients necessary to repair the thing. Grumblejack, if he has survived so far, may be transformed via a fiendish apotheosis and thus also increase in power, just to let fans of the ogre know! (This, of course, being purely optional!) Now, the PCs can create traps, have minions to direct and prepare the defences of their own dungeon – it should be noted that many of the enemies that will harass the PCs during the 222 days can be caught, broken and/or recruited – especially things like messenger-eating hangman-trees and minion-munching dire tigers might make for rather strong allies. Of course, the first though of most player-groups will be to keep the ritual secret. That’s not an option. The one-page beautiful artwork of the overgrown horn is ignited in green balefire and makes clear to anyone in quite a distance, that something is WRONG there. Take a look at the front cover – that’s your PCs’s new home and castle for the next 222 days and it is here that the adventure leaves any territory you might have played before. I already mentioned minions and indeed, the leadership-problem is tackled: Essentially, the adventure not only provides ways to gain allies, but also proposes a kind of super-party-cohort, purely optional, mind you. More interesting are the concise rules to run your own evil organization: Essentially, this module assumes an organization to have 6 scores ranging from -5 to 10, much like a character: Ruthlessness, Secrecy, Survivability, Connections, Espionage and Loyalty. Organization start off with 0 on each score and the leader’s charisma bonus may be used to enhance those scores. Since running a dungeon, abducting peasants for monster-food, indoctrination, smear campaigns, espionage and assassinations are all time-consuming endeavours, the PCs may thankfully delegate said tasks to the orphan-minions of their contact in Farholde, the vile, aforementioned baron. If they do a good job, they may whip the servants into an effective tool to sow confusion, disinformation and destruction. Each organization has a limited amount of actions each week depending on the charisma and level of its leader and 17 organization actions are provided, including chances to fail and 15 organizational events provide further opportunities/challenges. Editing and formatting are very good, though not perfect – I did encounter some minor glitches like an additional “t” after a full-stop or a formatting inconsistency in the organization-rules: The rolled-20-entry and rolled-1-entry are swapped in one entry. While not providing wrong information and amounting to about 5 glitches on the whole adventure, it’s not perfect. The adventure adheres to one of the most beautiful full-colour 2-column layouts I have seen in any publication, 3pp or otherwise. The pdf comes with a printer-friendly version that gets rid of the background, but not the colours or illustrations. The pdf comes with 4 pages of player handouts, which can be downloaded on the fire-mountain-page and the pdfs come with full bookmarks. Artworks are up to the highest standards, as is the cartography – Michael Clarke provides not only beautiful illustrations, but also stellar maps. Which brings me to the second minor gripe I have with this pdf: The town of Farholde-map comes without a key-less version of the map to hand out to players, which is a bummer, for the town is beautifully detailed.